Awaiting transport: “Eddie” the bald eagle rests at the Shuswap Vet Clinic. He was treated after being found injured in Eagle Bay and will undergo rehab at the Kamloops Wildlife Centre. ’Tis the season for saving eagles. 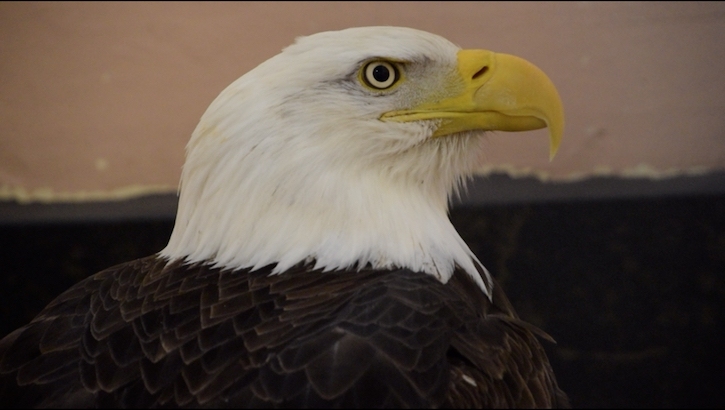 Found in Eagle Bay, “Eddie” the bald eagle was brought to the Shuswap Veterinary Clinic, Monday afternoon. Veterinarian Richard Auck said the bird possibly got hit by a car and experienced head trauma, as he doesn’t appear to have any broken wings. He was surprised the people who found the bird managed to catch him – warning that raptors are dangerous. “When they grab on to you, their talons lock and don’t let go,” he said, adding the talons can cut to the bone. Auck said to cover the bird with a thick blanket, and to ensure to cover the feet. He warns they may try to fight back by opening their wings and grabbing with their talons. The eagle found was smaller in size, with a feisty nature and will be taken to the BC Wildlife Park in Kamloops. “We want to make the public aware of how dangerous raptors are. Every bird has its own weapon,” said Auck. This is the third time Auck has seen a bald eagle in the clinic.